The Camilla Signature Special Edition speaker is a reference-level, two-way loudspeaker featuring a 9” woofer and a 1” tweeter. Regarded for decades as the ultimate configuration for a two-way design for being able to achieve almost flat off-axis response, the Camilla exhibits this characteristic quality. The 9” woofer in the Camilla produces very impressive low-frequency response while the reference-level, dome tweeter is capable of playing at a lower crossover frequency that lesser tweeter cannot. 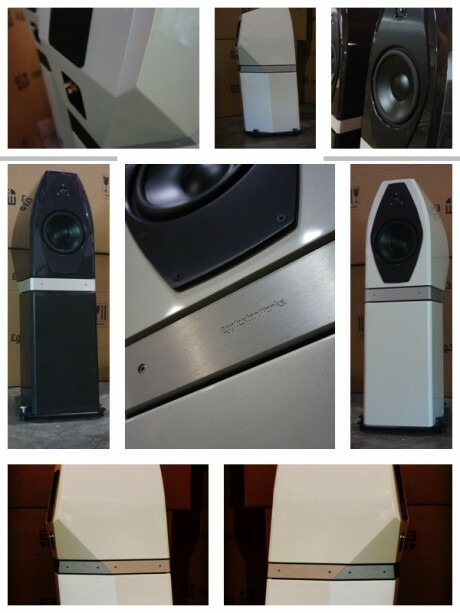 However the true advancement in design are in the cabinet of this beautiful speaker. The elegantly curving exterior creates an interior space that is almost free of any parallel surfaces. Additionally, the Camilla utilizes a resonant-free slot port that artfully exits the speaker in rear of the middle aluminum section of the cabinet. The overall size of the cabinet makes for a speaker that has incredible bass extension close to 1 Hz. The nature of the two-way design allows for use of this speaker in smaller rooms than most full range speaker can accommodate. This allows for those limited in space to enjoy a reference speaker with tight, deep bass in almost any environment. These seemingly small changes contribute greatly to already impressive performance as well as fit and finish. EgglestonWorks proudly presents the Camilla Special Edition as the latest in a long tradition of the highest quality loudspeakers.